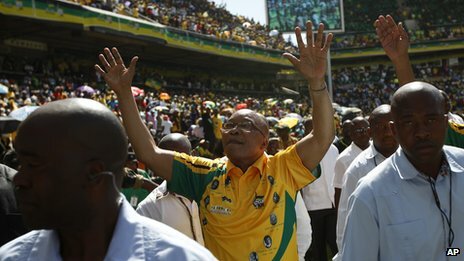 South African President Jacob Zuma has addressed a rally to celebrate the 100th anniversary of the African National Congress. He said the occasion was a joyous celebration for all the people of South Africa, not just for the ANC and its members. Tens of thousands of South Africans are attending the rally in Bloemfontein to mark the centenary. Frail health has prevented Nelson Mandela from attending the events. President Zuma paid tribute to all his predecessors as ANC leader, including the 93 year old, who led the party to power after the end of apartheid. Nelson Mandela has not attended any public engagements since the start of the 2010 World Cup. The crowd responded with a huge cheer when Mr Mandela’s name was read out. Mr Zuma said the centenary was an emotional and yet very exciting and moving occasion. The celebration was for “all the people of South Africa who with the support of the continent and the world destroyed colonial oppression and apartheid and are building a free, democratic, non-racial, non-sexist and prosperous South Africa together,” he said. The president added that it had been a long road since 1652 when settlers first arrived in South Africa. Jacob Zuma paid tribute to the many people and organisations who worked together to bring about a non-racial South Africa. He said the ANC was “a disciplined force of the left with a bias towards the poor,” but was also a broad church that was home to all. One of the biggest strengths of the movement was the fact that its supporters were “nationalists, Marxists, Africanists, workers, capitalists, women, men, youth, rural and urban, rich and poor,” he said. The president told the crowd that the ANC had achieved a 1942 resolution that by its centenary the movement should have one million members. The ANC now has 1,027,389 members, he announced, to cheers from the stadium. In 2012 the ANC would be taking “urgent and practical steps” to revitalise its grass roots and once again place itself at the forefront of a progressive pace of change, he said. Education and skills development would be at the centre of its transformation, said Mr Zuma. The party would seek to stamp out factionalism and “promote political discipline,” he added. African and world leaders, as well as Archbishop Desmond Tutu and African-American civil rights activist Jesse Jackson, are also in Bloemfontein for the celebrations. They attended a gala dinner on Saturday night, and an interfaith service on Sunday at the Wesleyan Church in Mangaung, just outside Bloemfontein, where chiefs, church leaders and other prominent people gathered on 8 January 1912 to create the liberation movement. A torch carrying the centenary flame, lit by Mr Zuma at midnight, was housed in a glass case at the front of the church. The flame was brought to the stadium for the rally at Bloemfontein’s Free State stadium. Mr Zuma began Saturday’s celebrations by leading the ritual slaughter of a black bull to remember, he said, “our ancestors, to remember our own gods in a traditional way”. The weekend of events in Bloemfontein began on Friday with a golf tournament. Andrew Mlangeni, who joined the party in 1951 and spent years in prison on Robben Island with Mr Mandela, took the opening shot. The tournament was criticised by commentators as a sign of the ruling party’s growing elitism – accusations dismissed by ANC spokesman Jackson Mthembu who said the party embraced “all sporting codes”. The opposition has also criticised the amount of money being spent on the year-long ANC centenary celebrations – a total of $12m (£8m). 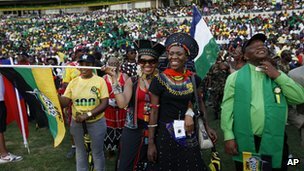 While the ANC is hailed as Africa’s oldest and most famous liberation movement, its reputation is being tarnished by corruption scandals, political infighting and reports of officials leading flashy lifestyles – and many South Africans believe the party has not done enough to improve the lives of the poor.